Much as we hope for eternal wear when we drop big bucks, we can't cheat the current of innovation. Just like a jacket, a piece of jewelry will flash its edge for a year or two, achieve acceptability for a good while longer, and then saunter out of style. When? Usually within ten to fifteen years for contemporary pieces, a decade or less for very fashiony items. A fine antique piece earns its keep into succeeding generations, but only if exemplary from the start. Flat-link gold chains, doorknocker earrings, most diamond ERs older than 20 years, all that Tiffany gra-doo (hugs and kisses, Return to Tiffany, dogtags, beans) and pretty much anything with a logo you can read without a loupe have seen their best moments. If interested in updating, research what's current, then save for one perfect piece. Monique Péan makes starkly beautiful peices with unconventional materials. 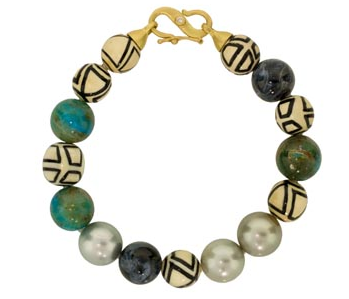 This bracelet is made from wooly mammoth beads, opalina, pearls and pietersite. See the tiny diamond set in the hook clasp? Price, $2,575. I'm reading your mind: perhaps something more affordable? 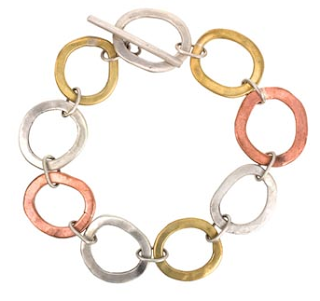 Consider Jane Diaz' silver, copper and brass Tri-color metal loop bracelet, which could mix with your bangles or live on its own. 7-inch length, price, $102. Modernity with pearl: Gabrille Sanchez' necklace of dégradé pink tourmaline and sunstone beads with a big Tahitian pearl and 18k clasp. Makes you realize how dated 97% of the pearl pendants out there are. (And an idea not all that hard to adapt if you have one to reno.) Price, $1,155. 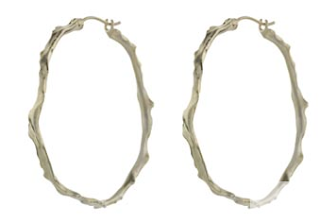 Many women rely on tubular gold hoops, the Ry-Vita of the earring world, lovable but safe. 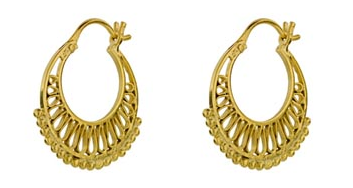 Jane Diaz small (7/8 inch) hoops are gold vermeil; price, $77. Note the small gold balls on the bottom curve; that's the detail we want. Annette Ferdinandsen coral stick hoops are a welcome change from stolid circles, organic and graceful in matte silver. Diameter, 1 1/2 inches; price, $275. I mean, sister, a ring that says you're livin' it up. Even if you have short fingers, ditch the small stuff–bitsy rings won't lend length. Try on designs where the stone goes south, not just north toward the nail. You'll see this really makes a difference. 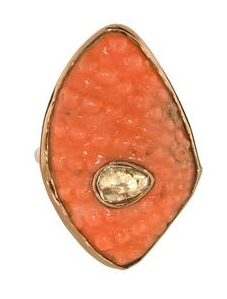 Deszo coral ring with polki (Indian-stye uncut) diamond on 18k rose gold band, $968. 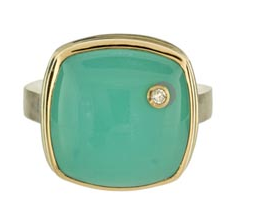 The chalcedony ring by Jamie Joseph shows a luscious big (and semiprecious) stone with an inset small diamond. Price, $726. Shown as example; currently out of stock but may be reordered. What to do with the dated stuff? 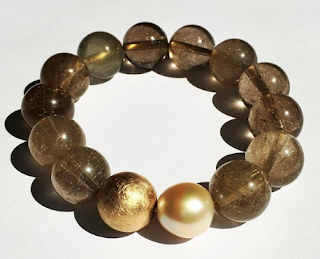 For semi-precious pieces, how about donating or gifting? Spring's church bazaars or other good-cause sales are both sources for donation and good places to browse as long as you don't end up with someone else's out of date baubles. You could hang on and wait for it to become stylish again, but I can guarantee that you'll no longer be charmed. You might eventually bequeath it to someone, and hope by then it will be a desirable antique, an iffy strategy unless someone has expressed interest. When the design is undesirable, dealers or auction houses are not interested, and private buyers, unless you find someone with specific (and stale) taste, won't want it either. 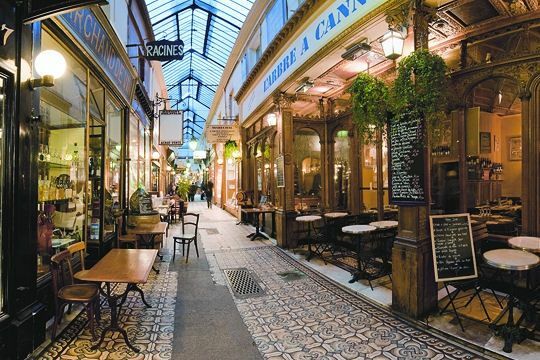 You can sell it for scrap value, but shop around for the best price. Meet Becky, who's wearing a white shirt and slim navy pants. 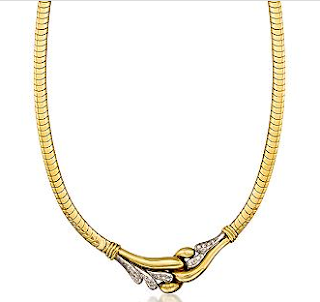 She's also wearing this gold curb-link necklace with pavé diamond accent, bought in 1983 with a year-end bonus when she was a corporate lawyer wearing skirted suits. She loved it till sometime in the 1990s. Then inertia set in, so she wears it anyway. Flash forward six months: Becky sold it after asking us what we thought. She's semi-retired, and doesn't want that "power look" anymore, either. She chose this Roseanne Pugliese 38-inch Modern Link necklace of silver and 22k gold, which she can wear long or doubled. (There are three gold link sections.) She did something noble with the leftover cash, don't press me. Duchesse, your aesthetic is so fresh and stimulating and I love the way your write, especially "don't press me." Once again you've inspired me to look into refreshing my jewelry. Love each and every one of these pieces you've shown! 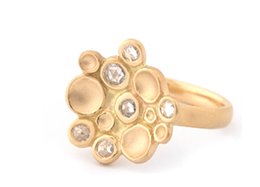 I'm still tickled pink with the engagement ring re-design Wendy Brandes did for me. We learned when we had my MIL's jewelry appraised for the estate not to think of even gold and fine jewelry as an "investment." Some very beautifully made pieces (for the 80's) now worth nothing but the scrap value of the metal and stones. I laughed out loud at the final two; yes, an 80's power necklace indeed (I have some so similar stuffed in the back of my scarf drawer), and, yes, utterly transformed. A great tutorial in self-fashioning. Thanks! Francie: Thanks, I always enjoy looking and am delighted to have company. Pseu: Like art, jewelry is a risky investment. An exceptional piece by an acclaimed house, a piece with historic provenance or jewelry made of superb quality (usually large) gems holds its value or may even appreciate, but most of our moms didn't have that. Gail: One of my gfs hosted a gold party at her house. Women brought that kind of necklace, single gold earrings, girly ID bracelets, all their old bits and pieces. (I wasn't able to go). My gf said they were very happy with the price paid. I have had great success remodelling jewellery over the years. The pieces that were not really worth the bother I sold at auction. Not for very much but everything helps. I love the pieces you chose...but even more I like the idea of cocktails and a girls night out swap. I have so much "power" stuff from the 80s and 90s (chokers, earrings, matching sets...you get the pic). I sold the Tiffany and "precious" things years ago. But I have noticed that good costume pieces are still highly collectible...the antique flea markets in NYC and ebay are brimming with dated pieces and many seem to sell well. I also have a drawer of my late mother's thirties and forties jewelry. I have fantasies of myself in a little booth at the flea one day when I'm no longer working! So, that leaves some faceless group of people who want to wear dated jewelery, perhaps ironically. When i moved, I donated shopping bags of that stuff to a church sale. I too have seen fleas and eBay sites glutted with the stuff. Sometimes designers will troll such places for necklaces etc. they can pull apart and restyle, but they want to pay very, very little for it. Chicatanyage: That is an option, but I see the dated stuff remain unsold there. Auction is good for current or vintage, though. SusanNYC: reading your comment again, I see you also refer to "good costume" pieces. Those ay well be swapped, as could be gifts of current items that just are not your taste. Strange as it may seem, I have found that people still like many of the "power" pieces from back in the day. I actually broke down this past winter and wore a beautiful multi-strand silver necklace with a Roman coin insert (present from the boss) and got more compliments than I could count. There is also something magical about the "free" concept...we do beauty night out, fashion night out, drinks and nibbles and lay out our unwanteds and the unloveds are always adopted. The one thing I will never part with is my vintage bakelite collection. SusanNYC: Sometimes you can put on a piece like that Roman coin necklace, giving it a current backdrop, and it looks terrific! Others, like the necklace I showed, are firmly in retro-land. However, I wear little contemporary costume, as dislike fake gold, imitation pearls, etc. Vintage costume can be stunning- the quality and materials were so much better, and bakelite is one of my favourite things on earth! Since you are a new commenter, you might have missed one of my constant mottoes: "After 50, your jewelry should be real". I don't mean precious, just real, even if a string of shells or a beach wood pendant. Any excuse to get together with women friends and drink wine sounds good to me! 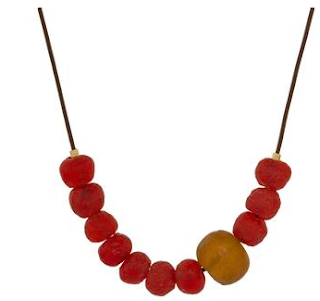 I've been looking at that same or a similar Rosanne Pugliese necklace as a versatile piece to wear with chinos or jeans and a button-front shirt for everyday, and am in the process of reevaluating much old jewelry and reconsidering what I actually need and want to wear. I'm not a fan of the pieces you've shown, although I do understand the "idea" behind them. To me, the pieces you've chosen, will also be dated very quickly, so a waste of more money. Although I tend to agree with you about women over 50 wearing "real" jewelry, if I wanted something trendy, I wouldn't pay a lot for it. I tend to buy jewelry that I consider classic and that won't go out of style. Now that opens an interesting sidebar: Does "real" make you feel good about yourself; does it project a sort of valadation to others; is it a rite of passage; a personal standard? For me, this is highly subjective matter. Precious metals, rubber, wood, "real" elements are fabulous. So are amusing fakes. I am totally open to everything in the world of jewelry...my only criteria is that it interests or enchants me. A blog like yours is lovely in that we get a lot of different persepectives and it sharpens (or changes) our own views. So much more interesting than those stupid, mindless fashion blogs, where everyone strives for the same level of conformity. By the way, as luck would have it, I went out for a coffee an hour ago and saw one of the Park Avenue dowagers attempting to hail a cab on Madison (good luck with that at 4:30). She was probably in her eighties, full Chanel, heavy matching necklace, earrings, multiple rings and bracelets. And you know what? Even though she looked dated, she still looked fabulous. I wanted to hug the old girl! I guess I'm not totally in agreement with this idea either. I don't have a lot of terribly expensive jewelry, but I have a few gold chokers & other things that fall into the 80s power jewelry category. I should probably ditch those, since I doubt I'll ever wear them...more because a choker style doesn't flatter me anyway. But my plain gold hoops I wear several times a week, and I have them in three different sizes! I do love the hoops pictured, though, and also have a pair of twisted gold ones my husband brought me from Italy a few years ago. Some styles are just so classic to me, I don't think I'll ever consider them dated. I also have some angst about selling pieces to be melted down....somehow that just seems wrong to me, unless they're broken. I might feel that way because I love antique & vintage, and I hate to see things "disappear". Unfortunately for me, neither my mom nor her mom had any real jewelry other than their wedding rings...I would have inherited it all, as the only daughter of an only daughter. What I do have, though, is a largeish collection of vintage costume jewelry, mainly pins, and many of those are sparkly! Love them, and I try to wear them when they can be worked into an outfit. Having said all that, I think I probably should take a look at my jewelry and figure out if I want to shed any of it, or give it to my teenage girls ( who don't wear much jewelry anyway). kathy peck: All jewelry will date, even what's supposed to be "timeless". Mature women in *only* their staid and safe "classics" look very conventional,and often their jewelry is not in step with their clothes, because they won't spend money there- which is not saying you look like that. But I have seen a lot of it. 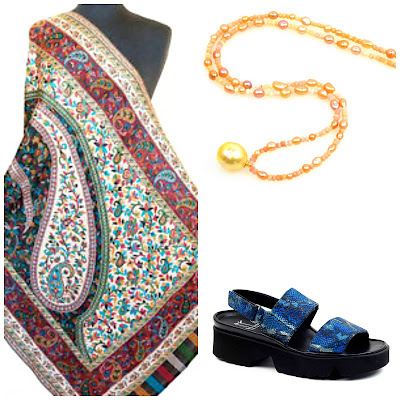 SusanNYC: I much prefer women in current, real jewelry or fine antique or vintage; if the old dowager look is what one aspires to, that is a brilliant description of how to do it. Costume, unless exceptionally well-designed (and therefore usually vintage), is soulless to me. Jill Ann: Antique and vintage is one thing, but why hang onto "power" gold that is now only passé? Better to sell because recyled gold is a far better environmental choice than new, mined gold. Many women wear "classic" because they are comfortable in it, and I see the appeal- so perhaps they might mix in a more current piece like the one of those rings along with those plain hoops. But since it's my blog: if I see another woman in one-inch tubular gold hoops I am going to fall asleep. Mardel: I have admired the pieces you have posted- and most of us have at least a few things it's time to pass on, in some way. Sorry, but I still disagree. I don't believe that all jewelry will date. A beautiful strand of pearls will always be stylish, for example. But, I'm going to let it rest here. I gathered all my bits and bobs together, and began to think about a redesign. And then I went back to work. Hmm. That was 7 months ago. I'm still planning. Either a cuff, as you showed me, or perhaps some Alexander Calder-esque chandeliers. kathy peck: I agree a strand of pearls is about as timeless as it gets. While the gems themselves may not date, it is the *styling* that usually gives the era away. So, I've updated the clasps on my pearls. Some beautiful things here, and a great argument for fresh design. Monique Pean's work is just dazzling; if I were the sort to spend real money on jewelry, I would choose something by her. 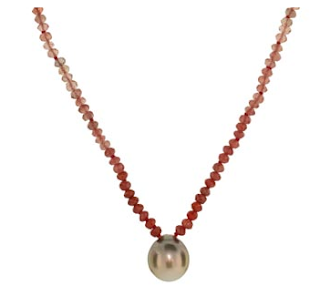 The Tahitian pearl and tourmaline necklace is heavenly, too. But I am so unserious about jewelry, I probably shouldn't even comment. I have no diamonds or power necklaces to dispose of, just some old Mexican silver things I will always love. Mostly, I look for tired, inexpensive pieces (with good ingredients) in thrift stores, take them apart, and reconstruct them to suit me--or my whim, anyway. As for the fake-vs-real debate, I always ask myself whether a thing will look worse with wear, or better. If it's the latter (as with most handmade, authentic items) I'll take it. P.S. 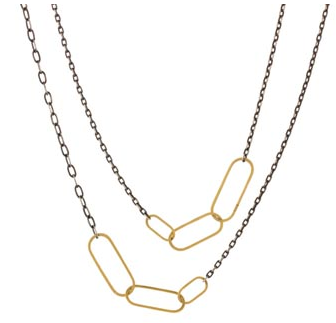 to SusanNYC: Your silver strands and Roman coin necklace sounds pretty wonderful to me! I will instead wear my larger, twisted Italian gold hoops, much less snoozeworthy! Jill Ann: Guess I won't wear mine, either! When I do wear them I try to have a wilder other piece on. c.: It is the soulless quality of so much costume that makes me pause. Too-shiny metal, glass pearls without the depth of nacre, stamped instead of hand-cast settings. I've liked some costume (Marni most recently) but the price is so high for that level, realize I could buy a vintage piece of silver or an armful of bright straw bangles handmade in Africa for less. Am not a woman who will only wear "important" jewelry, it is just as you say, the costume often does not wear well. I do have some "unreal" things and will post them fairly soon. No time to read comments now - just wanted to let you all know i visited Lauren Wolf's jewelry store Esqueleto in Oakland recently. It is full of gorgeous modern pieces by jewelers who are open to working with customers on unique pieces, including Lauren Wolf herself. Feast your eyes! While shopping the store i noticed that the silver sharkskin signet ring would make a brilliant cuff/small hoop earring for everyday wear. As it happened, i was mentioning this to Ms. Wolf herself! i felt a wee bit awkward, but Ms. Wolf was keen on the idea and when i returned later that afternoon (after checking out the rest of the temescal alley goods) she was able to show me the start she had made on my idea. It looked even better than i envisioned! Steph: Thank you so much for sharing Lauren Wolf's work. I would break the bank for many of these pieces and I'll link to it in a later post since many readers won't wander back to this post to see your contribution. Exceptional!